Unlike cropland, which has shifted toward larger farms since the 1980s, the other major component of U.S. farmland� permanent pasture and rangeland� has shifted to smaller farms. In 1987, farms and ranches with at least 10,000 acres of pasture and rangeland operated more than half (51 percent) of all pasture and rangeland, while those with less than 1,000 acres held 15 percent. By 2012, the share operated by the largest acreage class had gradually fallen to 44 percent, while the share of farms and ranches with less than 1,000 acres of pasture and rangeland had risen to 22 percent. Consolidation in cropland is driven by technologies �such as bigger, faster, and smarter pieces of equipment �that allow a single farmer or farm family to manage more cropland. Improvements in those technologies have not led to consolidation in pasture and rangeland, however, because planting, spraying, and harvesting machinery are rarely used on pasture and range. Pasture and rangeland are primarily used for grazing beef cows and their calves, although other livestock such as sheep, horses, and bison are also grazed. 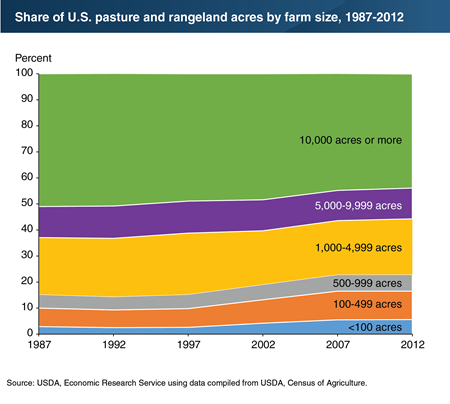 In 2012, 45 percent (over 400 million acres) of all U.S. farmland was devoted to pasture and grazing land. This chart appears in the March 2018 ERS report, Three Decades of Consolidation in U.S. Agriculture.